Karibu Kenya! 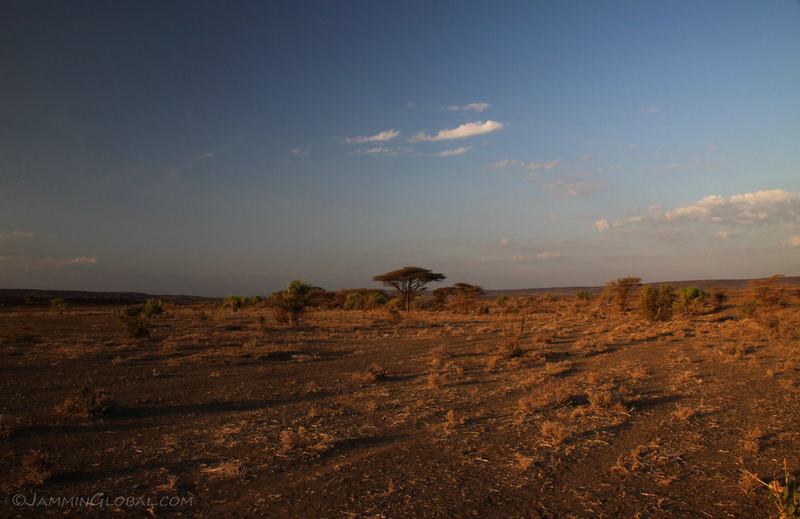 Welcome to the land of vast savannahs, desolate deserts, verdant forests and sublime beaches. 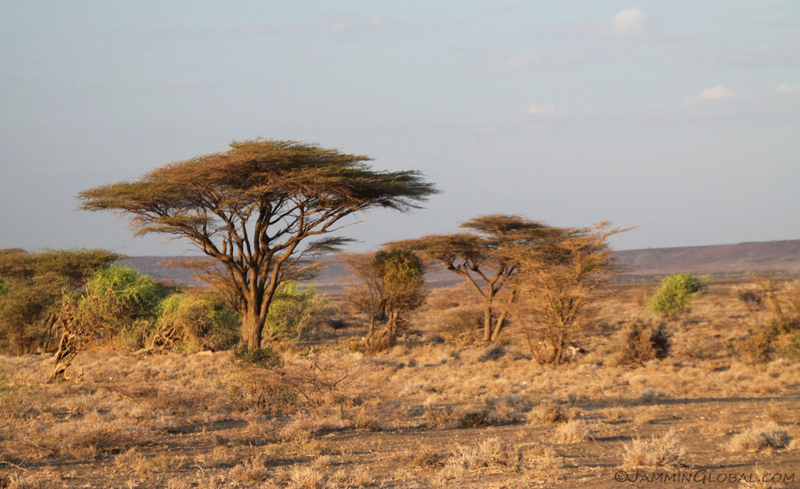 Kenya straddles the equator and is blessed with a variety of landscapes and peoples who have made this the most developed East African country. Most of that development lies in the southern portion of the country with much of the north still being untamed. 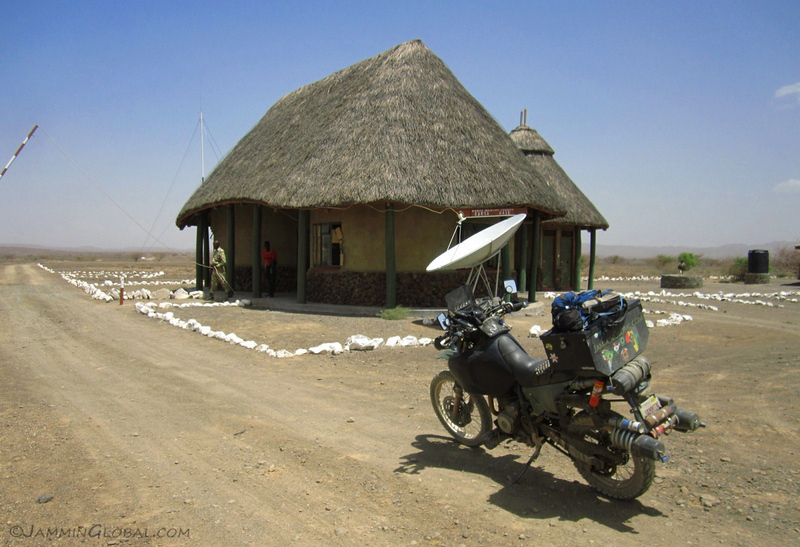 I entered Kenya at Lake Turkana and went down its eastern shore, passing through the towns of Illoret, Loyangalani, Baragoi and Maralal, where civilization (in the form of regular petrol stations) was recognizable once again. 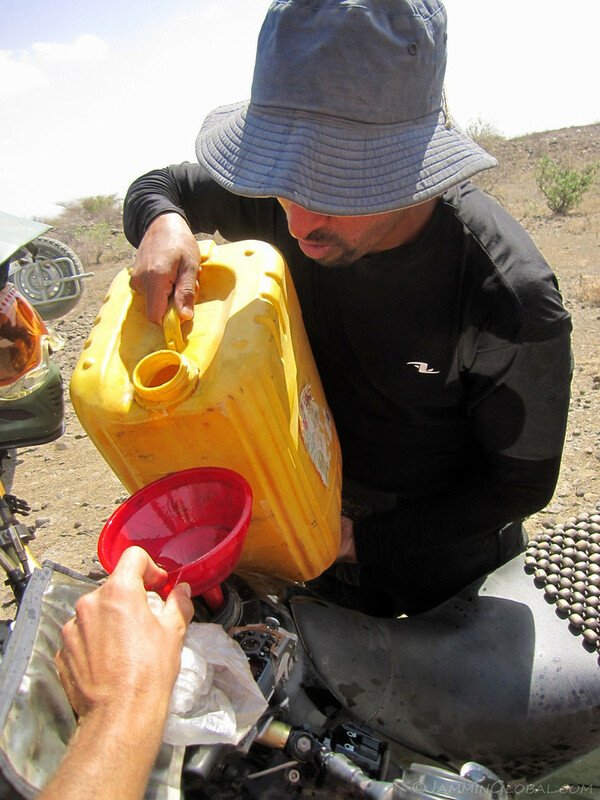 Starting from the remote Omo Valley in southern Ethiopia, the route involves a 900 km (560 mi) stretch between petrol stations, meaning that water and food were also in scarcity. 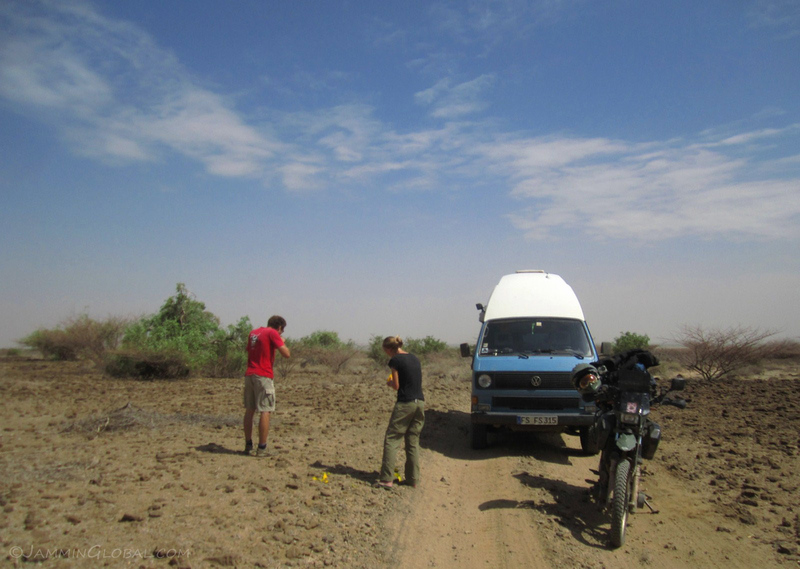 I teamed up with fellow overland travelers for this route so that they could carry extra fuel, water and food for me in exchange for a chicken curry. 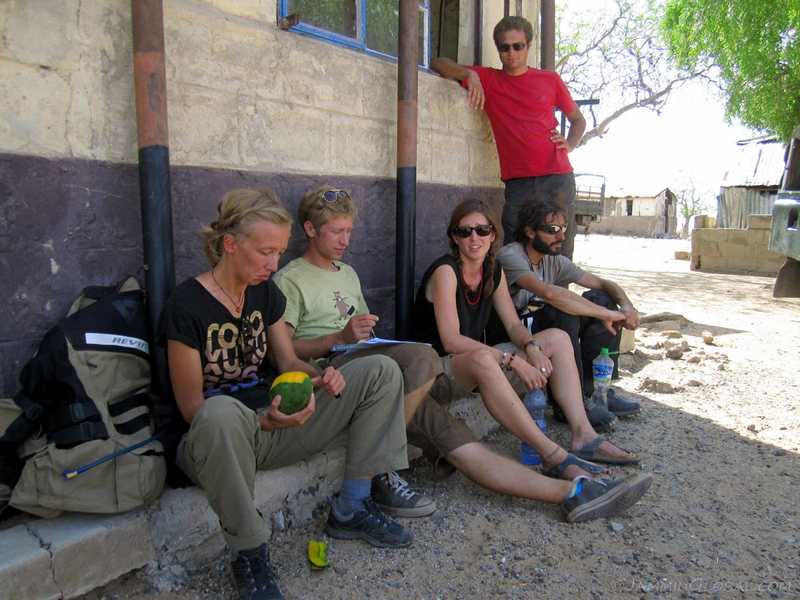 The company was also enjoyable in the remote wildernesses. 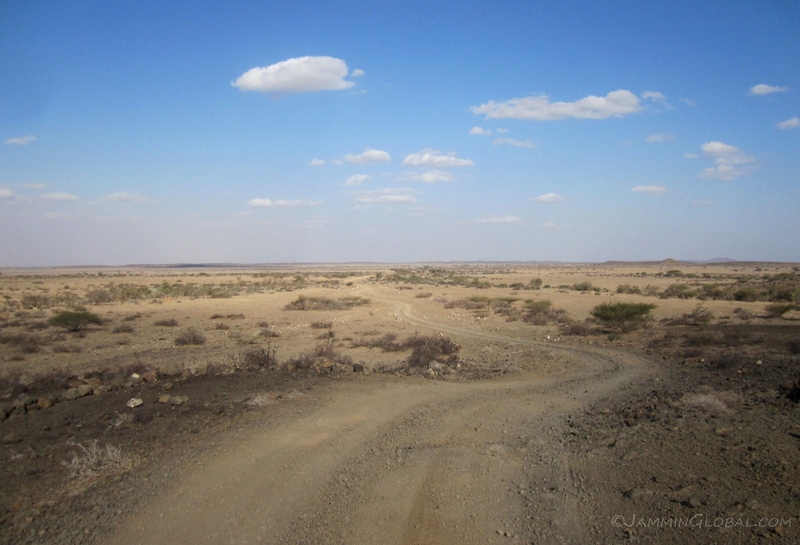 Most of the overland route down eastern Africa is paved and relatively easy, expect for this crossing between Ethiopia and Kenya. 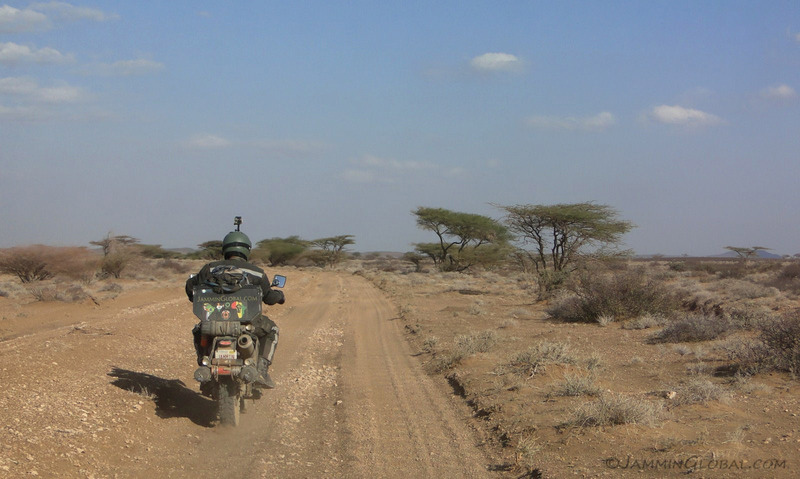 The more popular route is to enter Kenya at Moyale and then head down the bone-jarring and suspension-breaking road to Marsabit and onto Isiolo (currently being paved). 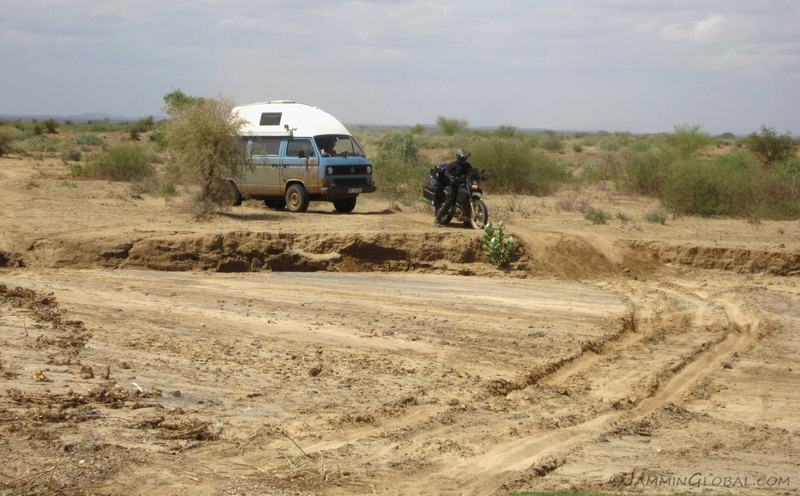 But the more adventurous route is to enter Kenya at Lake Turkana and experience a bit of Wild Africa. 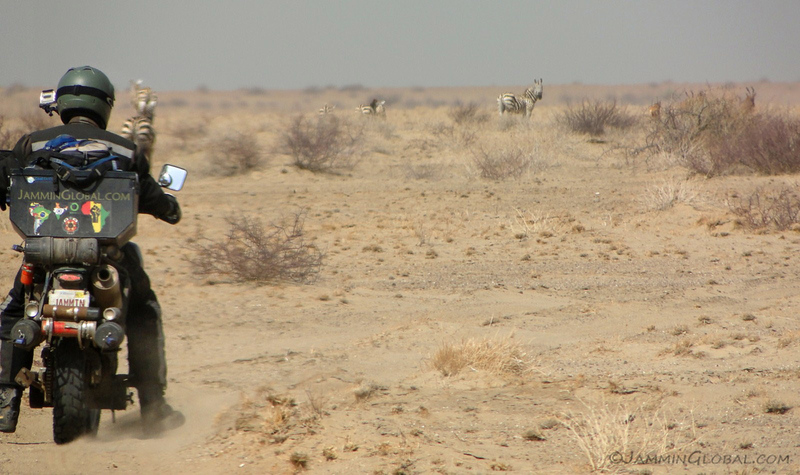 The terrain is tougher (mostly sand and sharp rocks), longer and more varied (ranging from hot desert to mountainous forests). 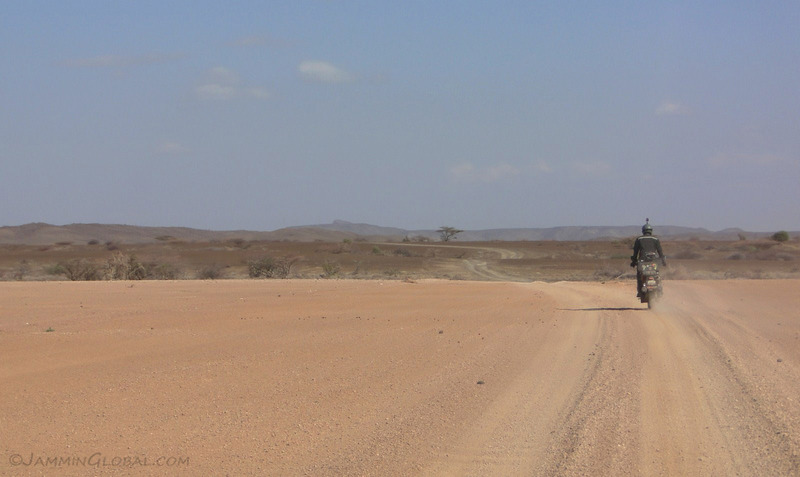 After getting our passports stamped out in Omorate, the last town in southern Ethiopia, our convoy of overland travelers turned south for the Kenyan border. 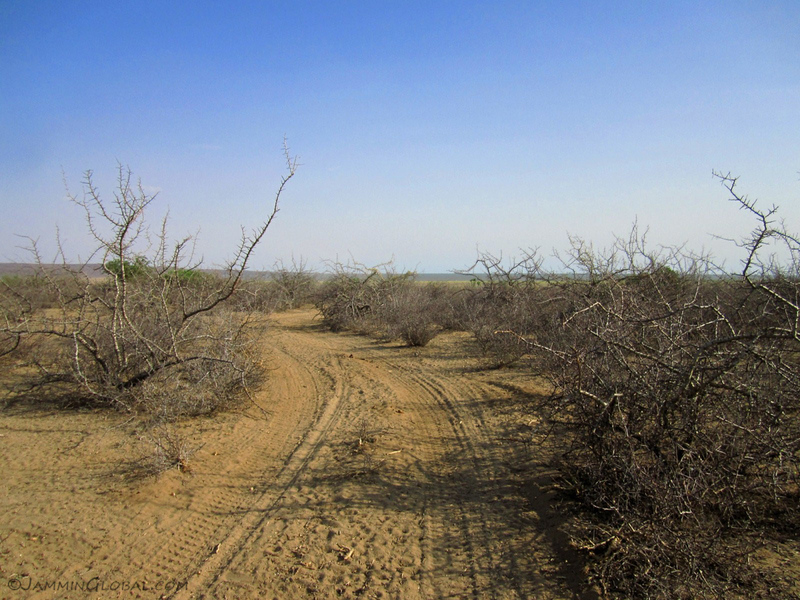 The route started off with soft sand through acacia trees. 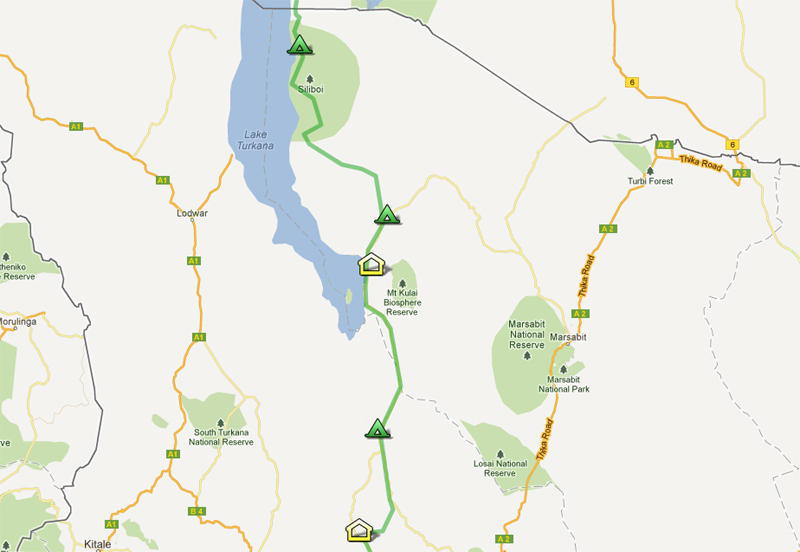 The Lake Turkana Route, coming down the eastern shore. Click on it to go to the interactive version in Google Maps. 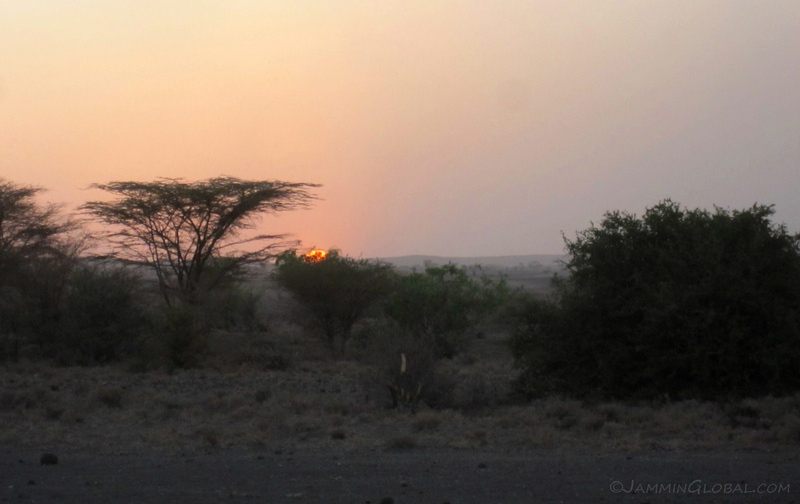 The first night was spent camping in wilds of Sibiloi National Park, followed by camping in the bush before Loyangalani. 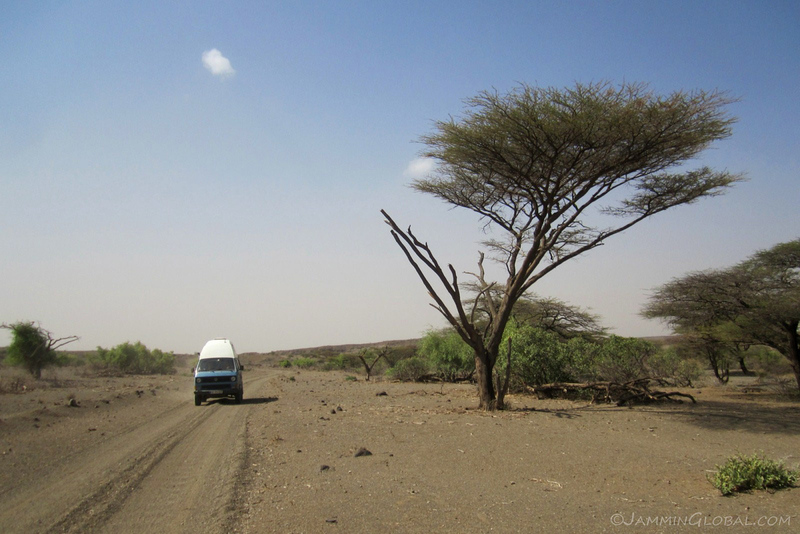 After a day of rest at the campsite in Loyangalani, the convoy got smaller and we bush camped just past Baragoi before getting into Maralal. From there, the asphalt starts soon and the adventure gets tamed. sanDRina was over-loaded for tackling deep sand and I had two falls. 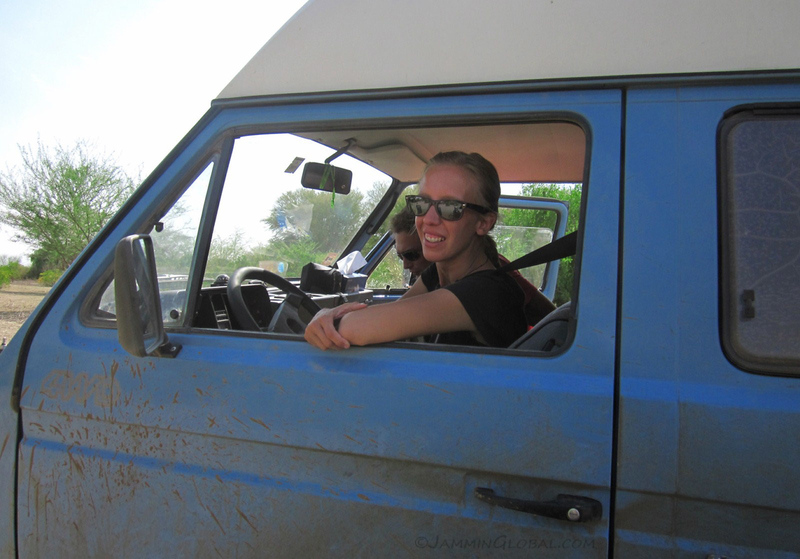 It was nice to have Ferdi and Katie following behind in their VW Syncro as Ferdi was ready to jump out and help me up. 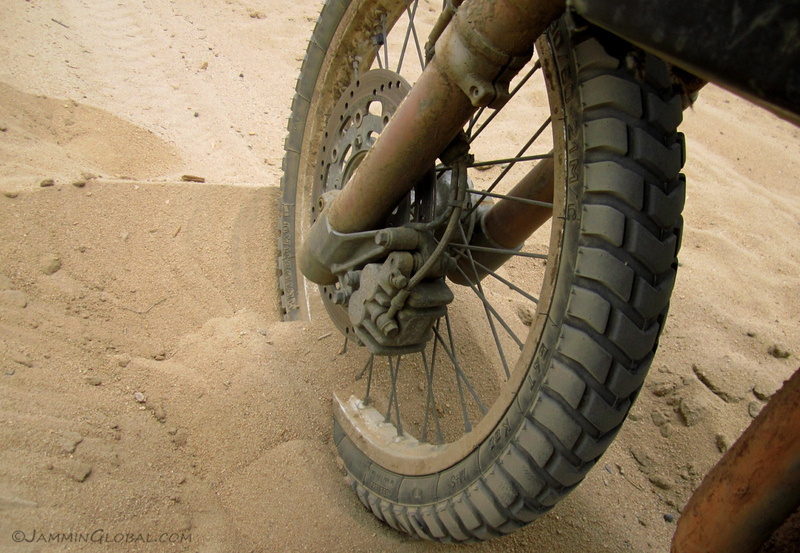 Not the most ideal tires for riding sand, but I managed. There was a trail to follow on the ground and it roughly matched the trail in the Tracks4Africa GPS mapset, which is made mainly by tracks from travelers. 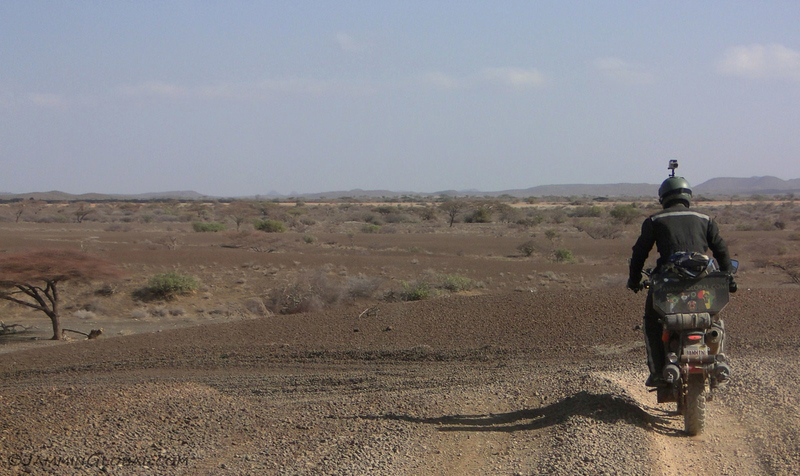 Crossing one of the 30 dry riverbed crossings that the Turkana Route is famous for. 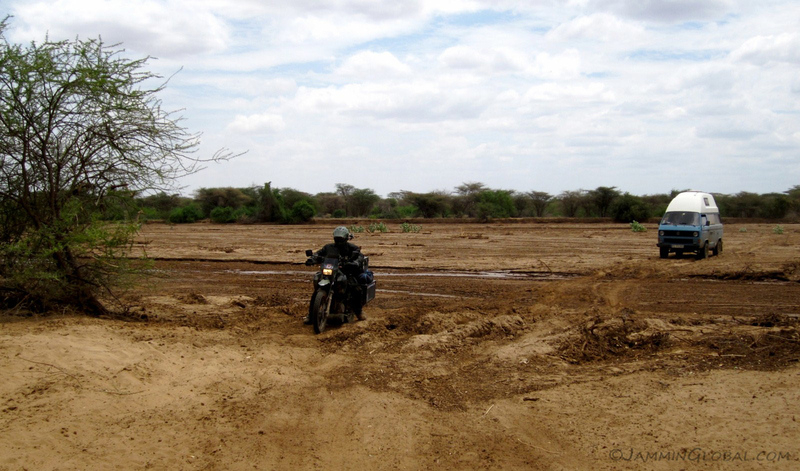 This route is only possible in the dry season and we were riding it just at the tail-end of the rainy season, so some riverbeds were moist and muddy, but most were just sandy and rutted. 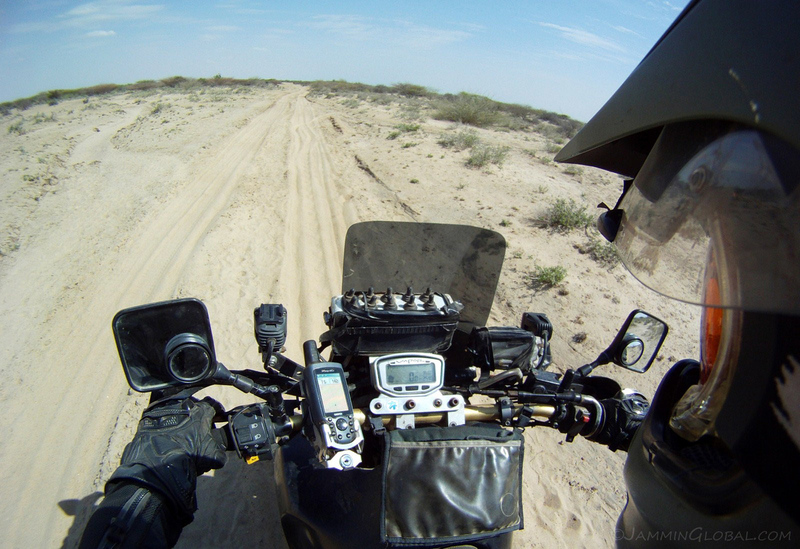 I was taking it slow on the sandy stretches, after my two drops and just kept jammin’ to my tunes and not thinking about the hundreds of kilometers ahead through more sand and expected rocks. Where the terrain was hard enough, I could get some more speed and get up on the pegs and feel more comfortable. 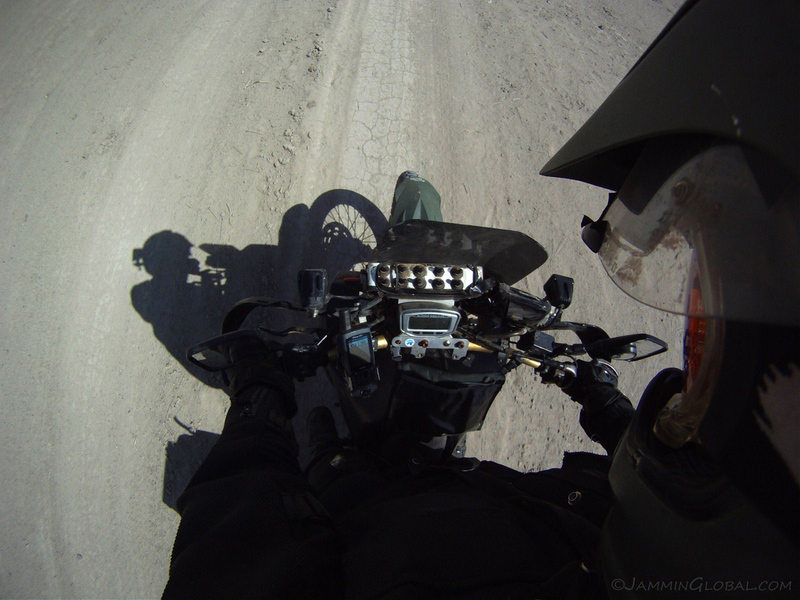 Offroad riding is much better when standing on the pegs, but you need enough speed and that comes with confidence. Choosing my path before entering this dry riverbed. The entrances and the exits are the trickiest since they’re steep and covered in sand. Gravity at the entrance gives me momentum, which I have to direct over my desirable path and then keep the momentum up, since the middle could be soft and bog me down. I carry this momentum through and choose my exit path and keep the throttle open until I crest back onto the mainland. It was getting hot and I enjoyed the wind blowing through my mest suit whenever I got the chance to stand on the pegs. Smiles all around as we enjoyed a real sense of adventure, crossing remote wilderness and looking for the border with Kenya. 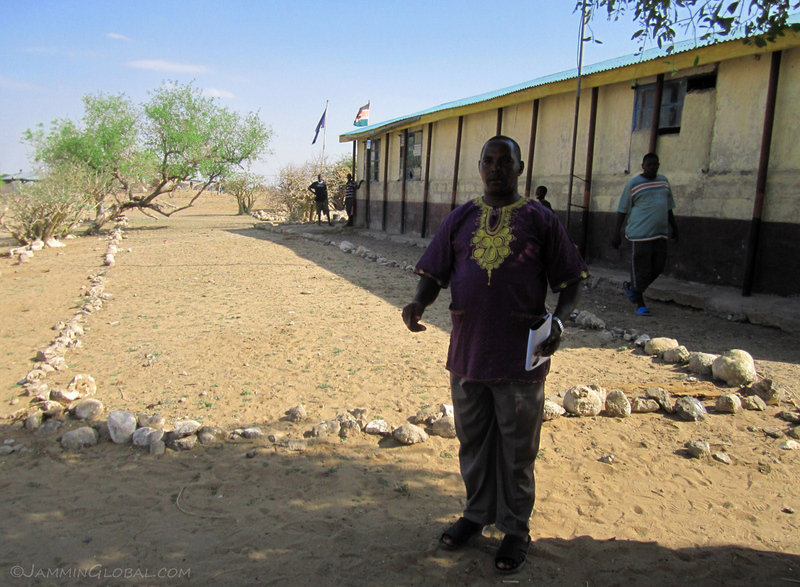 We passed through many small villages that smelt of fish coming from the nearby Lake Turkana. We must’ve looked truly alien to them. 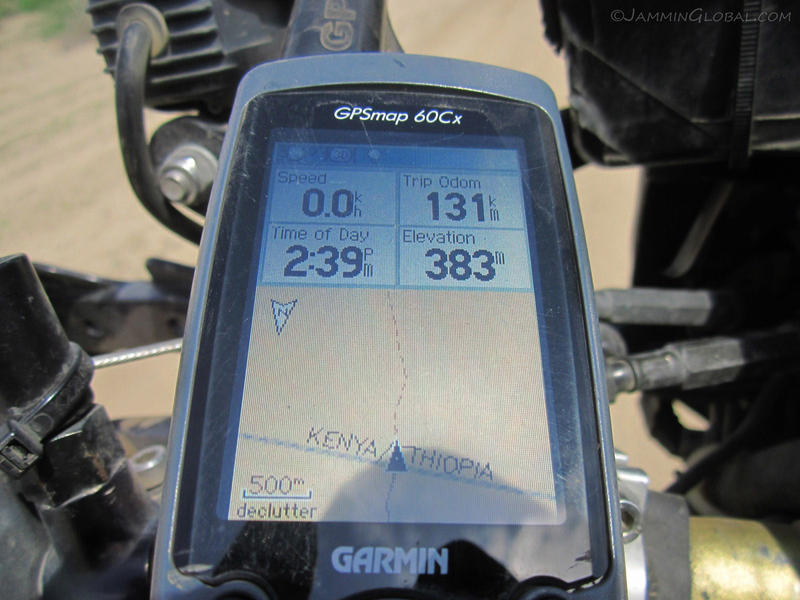 …a line in the GPS maps showing that we had entered Kenya. 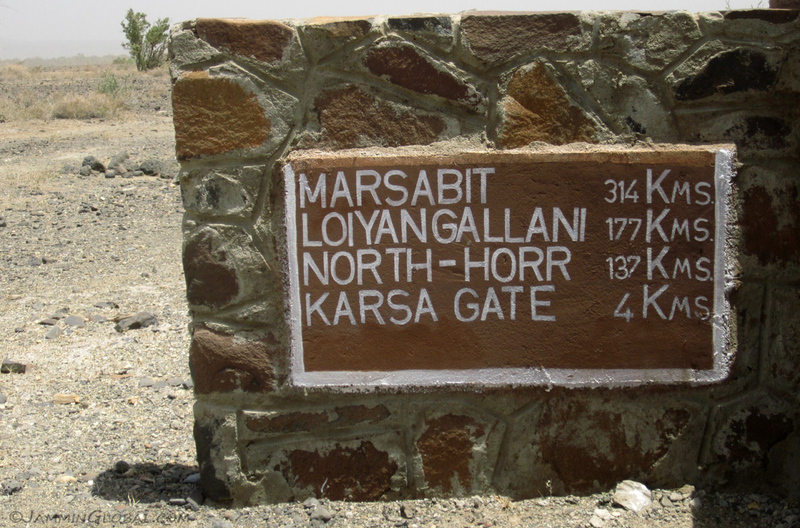 Since this route is so remote and used only by travelers, there is no official border crossing. I love it, because it highlights how borders are such a man-made notion. …Katie at the wheel. 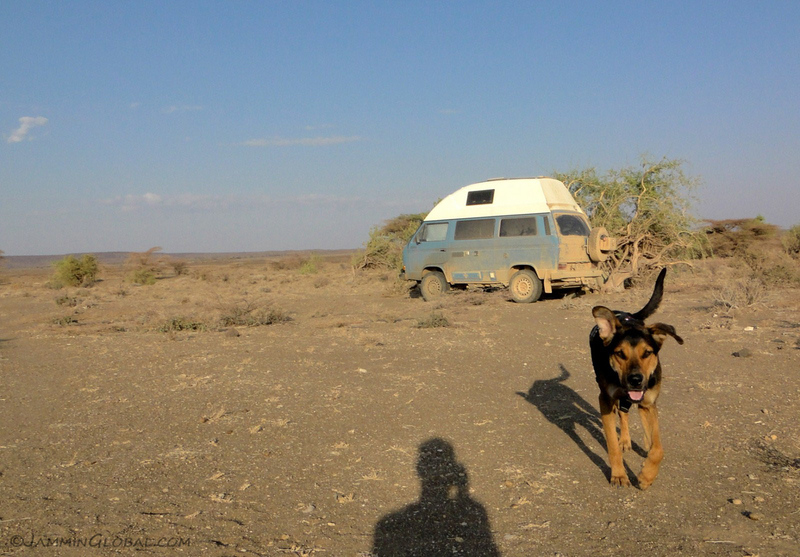 She was thoroughly enjoying this excursion into Africa and was glad to have met Ferdi who introduced her to a life of camping and traveling. Rolling into Illoret, the first town on the Kenyan side, about 16 kms (10 mi) from the border. 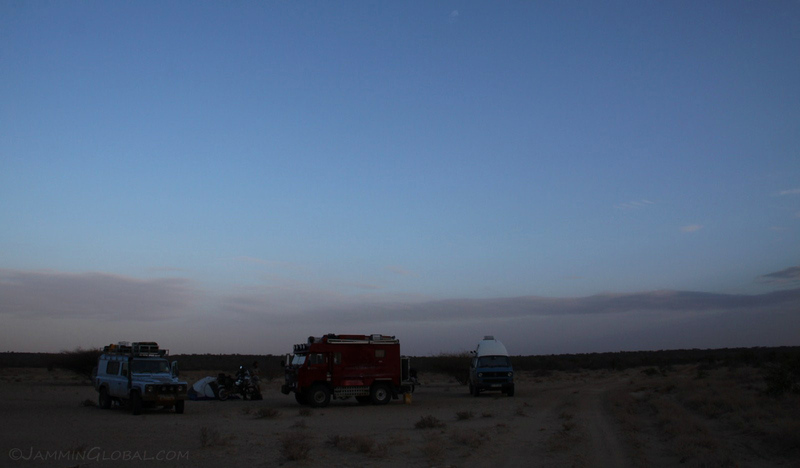 We caught up with the other travelers in our convoy who had been waiting for us since we all planned to camp together that night. There is no immigration or customs post on the Kenyan side of the Turkana route, but this police official here in Illoret wrote us a letter addressed to immigration in Nairobi saying that we entered Kenya on this date with this vehicle. Upon reaching Nairobi, we’re supposed to take this letter to immigration where they finally stamp in our passports. While waiting for our letters, the police official shared the rest of his lunch with us, giving us our first taste of Kenyan food: ugali, cabbage fry and chicken in a sauce. It tasted good but I’m not a fan of ugali (maize meal). 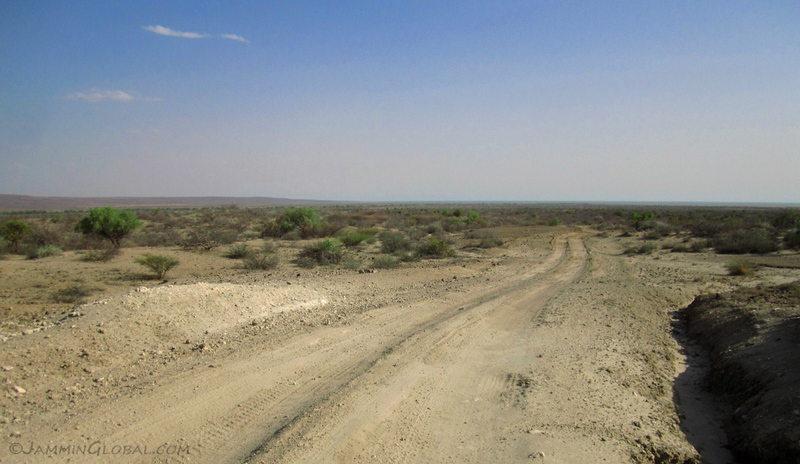 Getting a glimpse of Lake Turkana on the horizon as we entered Sibiloi National Park. 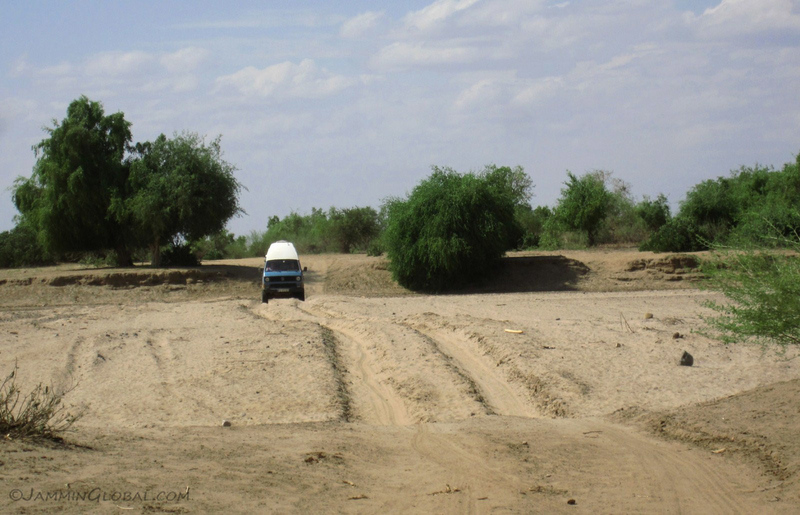 Navigating a sandy riverbed. I was getting tired as the day neared its end. 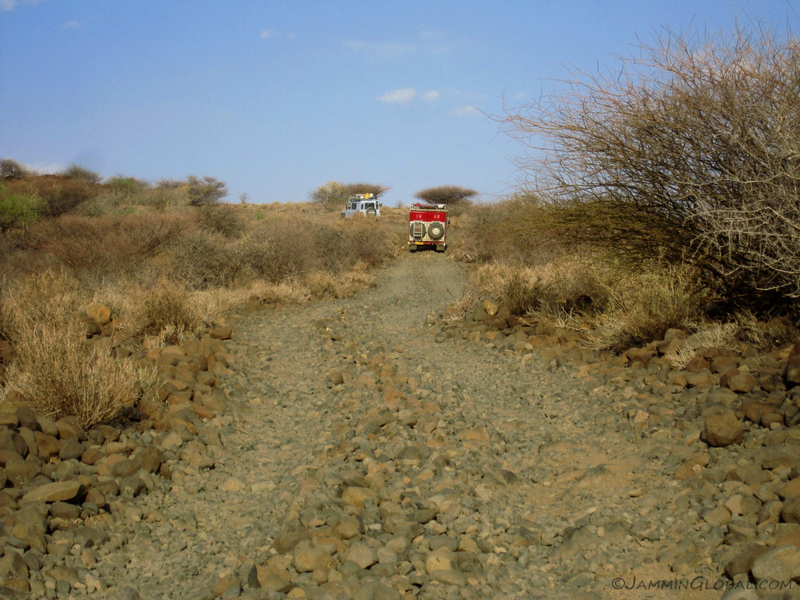 The track looked like it was bush-whacked through dried acacia trees and we were glad that no one got a puncture from being so close to sharp thorns. Climbing a steep and rocky incline. This was a tough stretch. I couldn’t keep my uphill momentum due to the large size of the rocks (baseball size) as they kept throwing the handlebar around. sanDRina’s clutch was also getting tired and we took a break halfway. Guy in the blue Land Rover offered to carry one of my panniers and Peter in the red Land Rover took the other. Relieving sanDRina of about 40 kgs (88 lbs) was just what we needed to make the riding fun again. 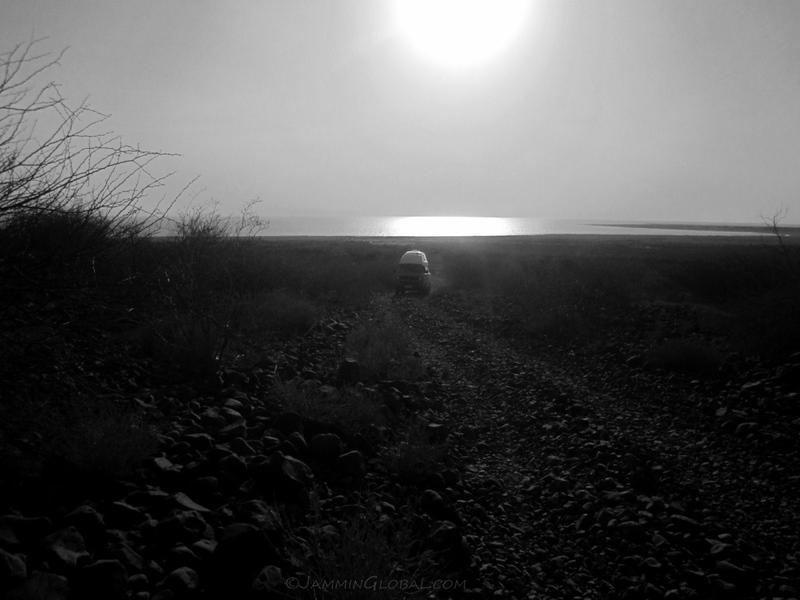 Ferdi and Katie climbing up the rocky route with the sun setting on Lake Turkana. We setup camp just before dark and Katie gave me two liters of water to shower with, which felt great after a hard day’s ride. 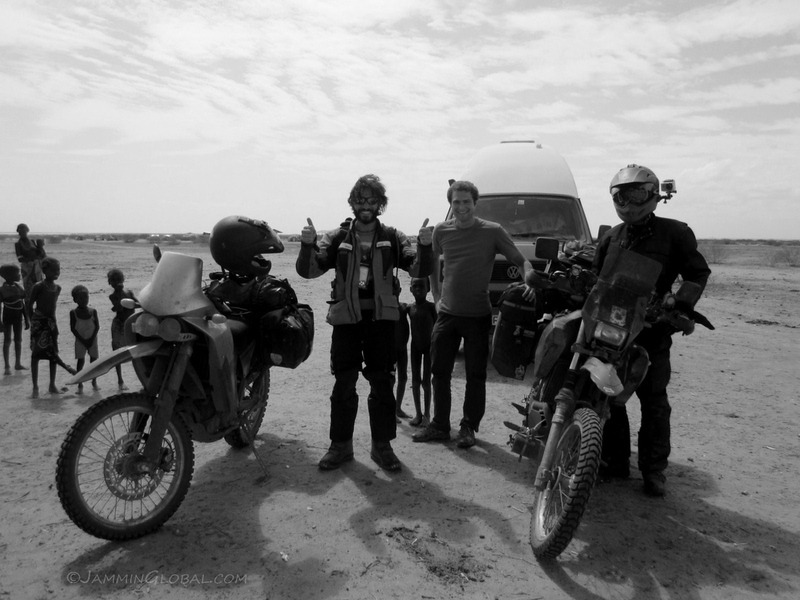 It was time to keep my side of the bargain with my fellow travelers who were carrying fuel, water, food and now my panniers for me. I paid up the best way I know how: preparing one of my chicken curries! Everyone helped in cutting the veggies and Peter and Jill offered their kitchen for me to cook my curries in. I also made a potato curry. 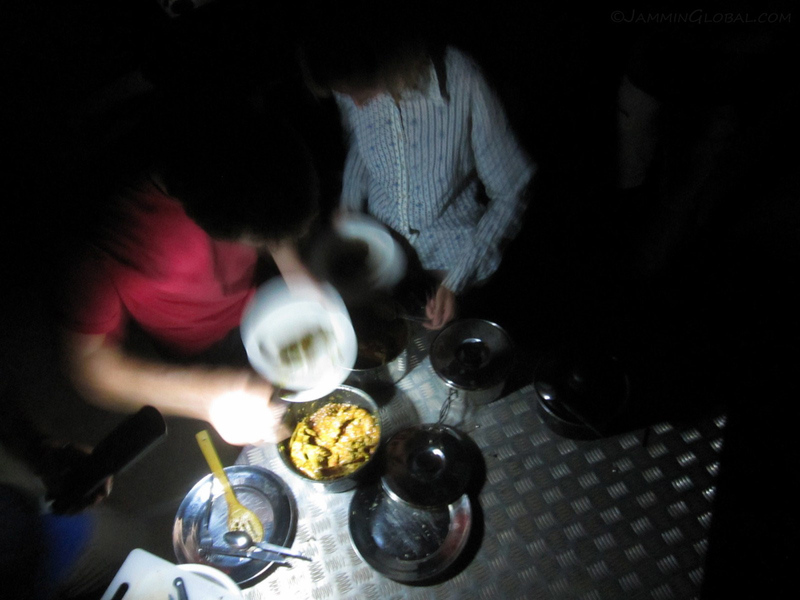 Serving my chicken curry out the back of Peter and Jill’s Land Rover. 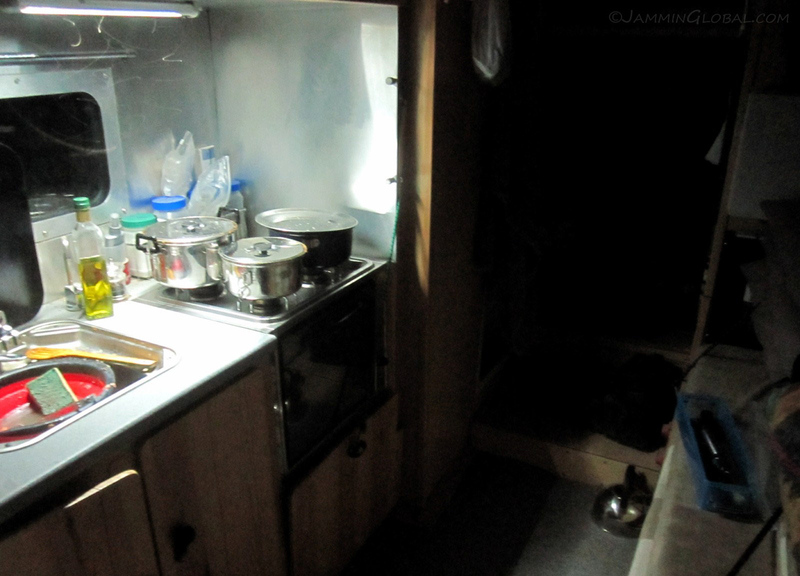 This was definitely the most remote place that I had cooked my curry and was pleased to share it with my fellow travelers under a starry sky on the shores of Lake Turkana. Just before sunrise in Sibiloi National Park. 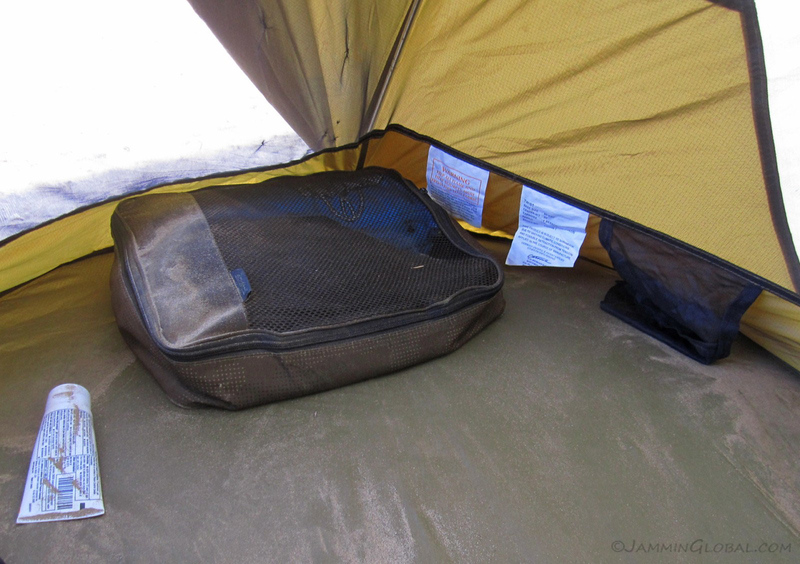 It was a rough night as sand kept blowing through my mesh tent and settled down on everything. The warm temperatures meant that I couldn’t stay inside my sleeping bag and thus had sand stuck on my sweat. Oh and that’s my pillow, one of my packing cubes. The others took off quite quickly, while Ferdi, Katie and I enjoyed a slower pace to the morning. 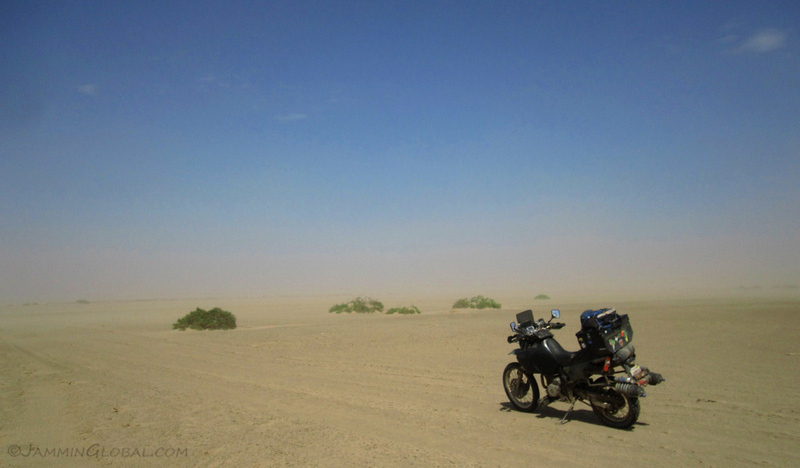 I was riding much better without the weight of the two panniers and was enjoying myself, standing on the pegs through bleak landscape with Lake Turkana hidden behind the dusty haze, swept up by the strong winds. 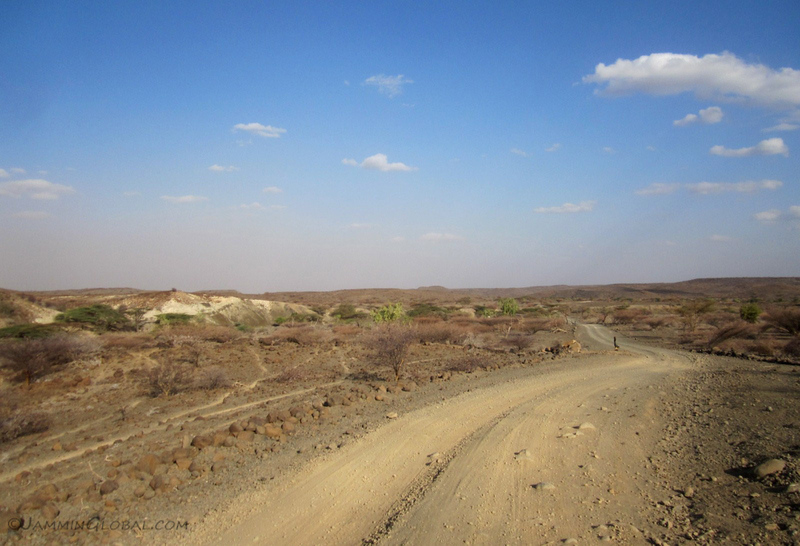 I didn’t expect wildlife in such a desolate setting but we saw zebra, kudu and other antelope in Sibiloi National Park. Taking a mango break as the temperatures picked up through the day. 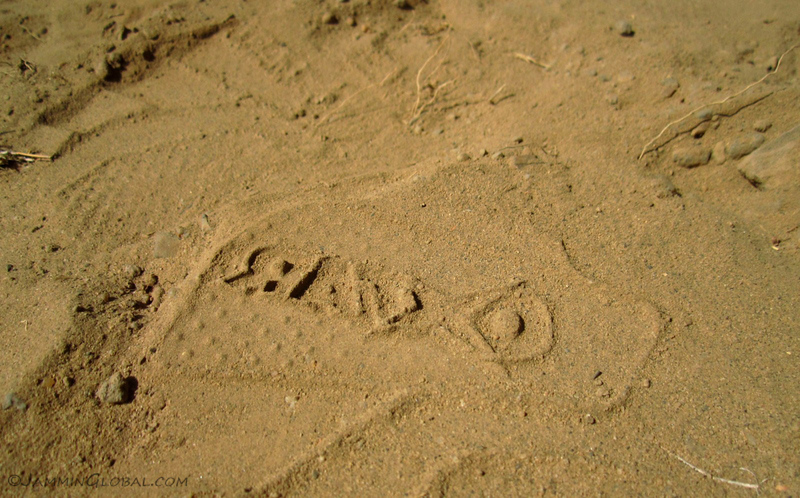 Leaving my boot mark in the sand. I took nothing but photos and left nothing except foot (boot) prints. I was in my groove and riding to the rhythms of the land with its undulations and loose surface making us dance in the desert. 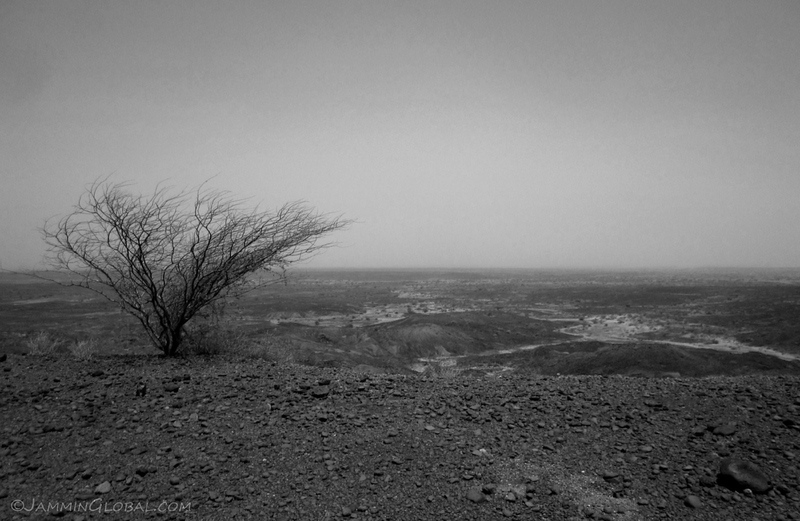 Looking east towards the Chalbi Desert with a lone leafless shrub watching over the whole land. 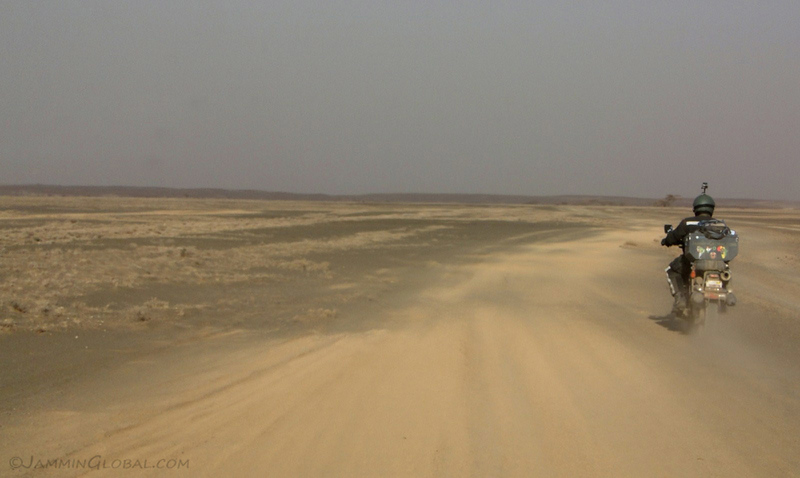 A distance board at a junction in the desert. 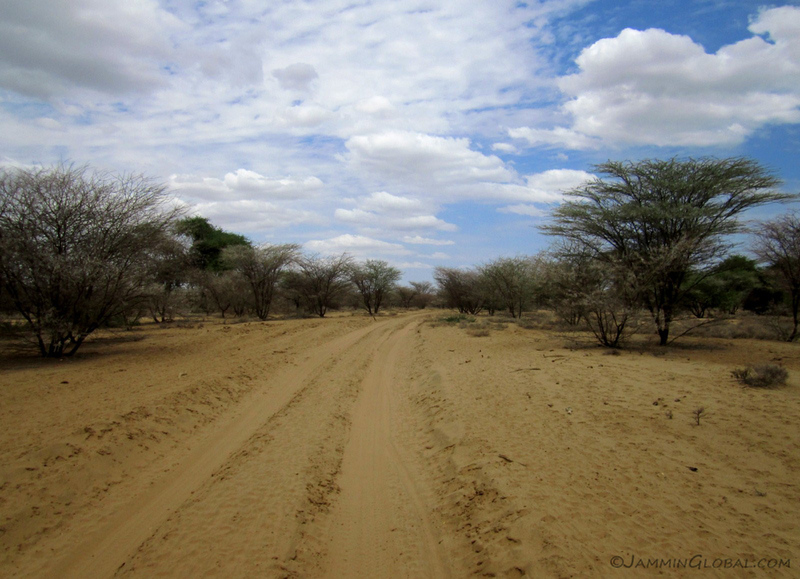 Heading east across the Chalbi Desert from here would take us to Marsabit, but we were heading south to Loiyangallani, but first to Karsa Gate, the entrance to Sibiloi National Park. 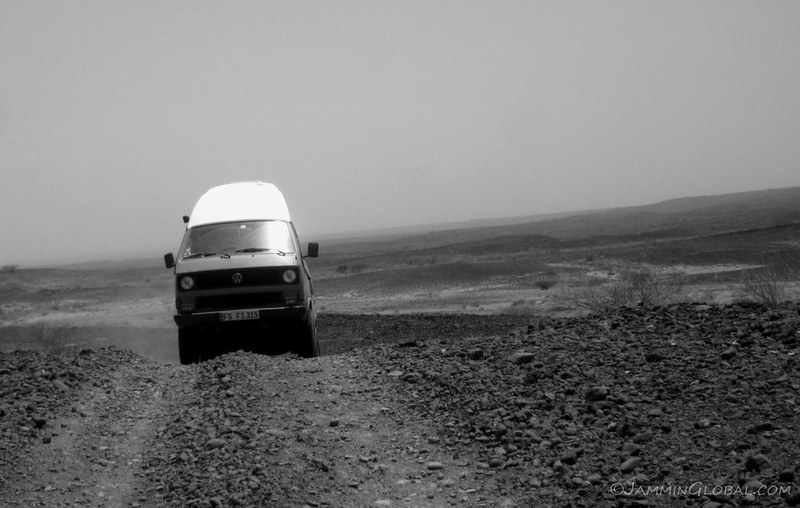 The Syncro cresting the desert road. 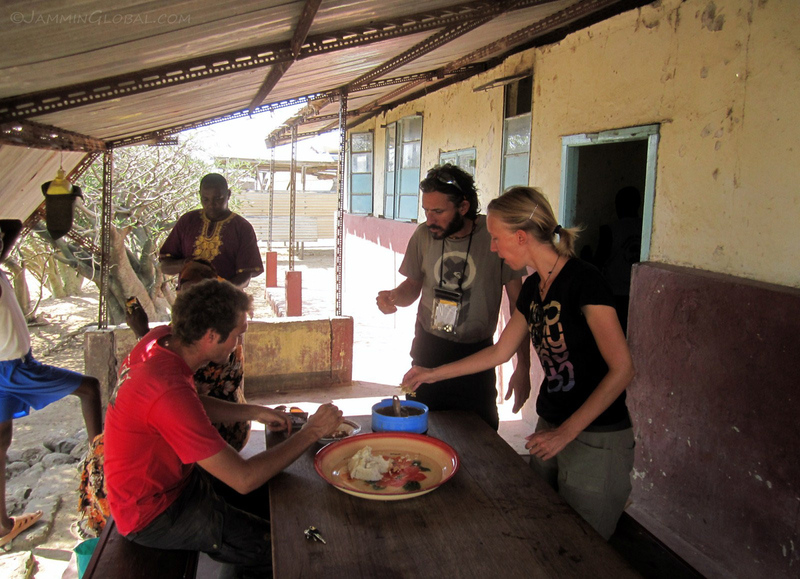 Exiting Sibiloi National Park and getting our first taste of how things work in Kenya. 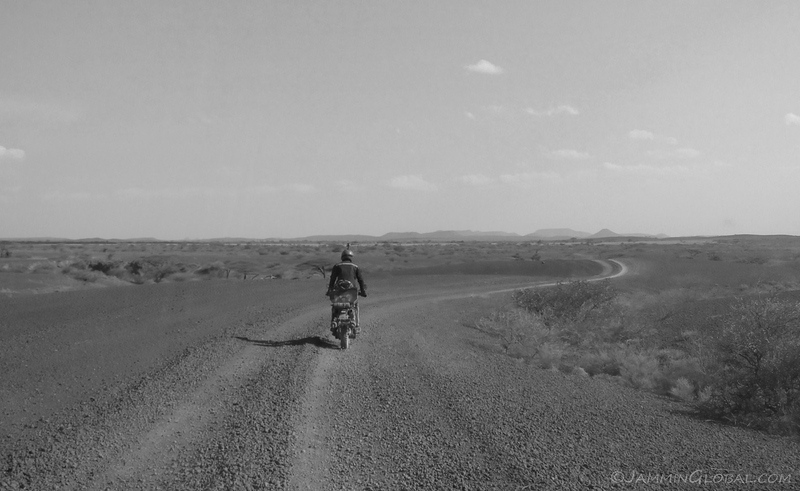 The fee for being in the park was $20 per person and then the fee for a motorcycle was 300 Kenyan Shillings ($3.25). For the van, the Kenya Wildlife Service officer said it was K1000 but it was negotiable. Ok, so we got it down to K500. Nice to be in a land where everything’s negotiable. 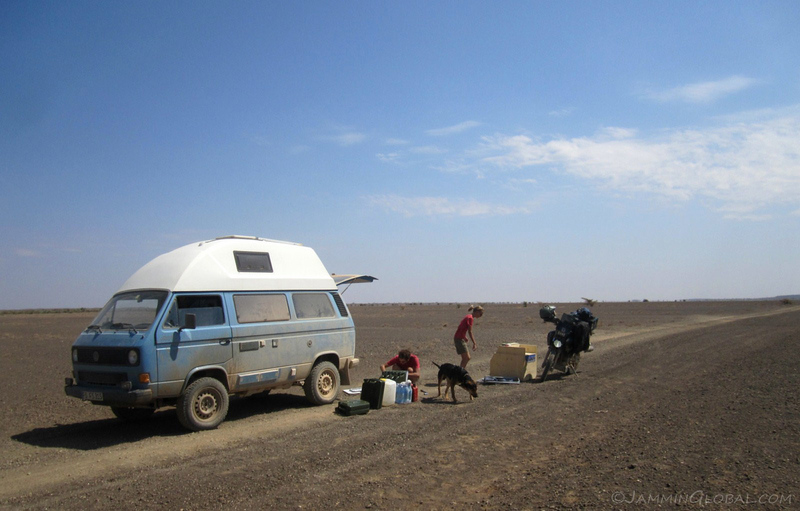 After getting past the gate, we stopped for lunch (leftover chicken curry and rice) and I relieved Ferdi and Katie from carrying my extra fuel around and put 20 L (5.3 gal) of go-juice into sanDRina. 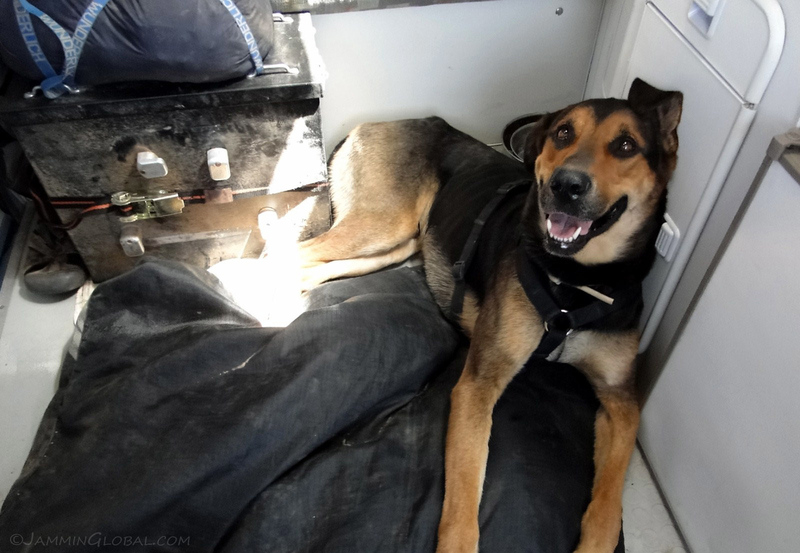 Poor Kayous had his space reduced by my pannier but we were becoming friends by now and I think he understood. Thanks, buddy. 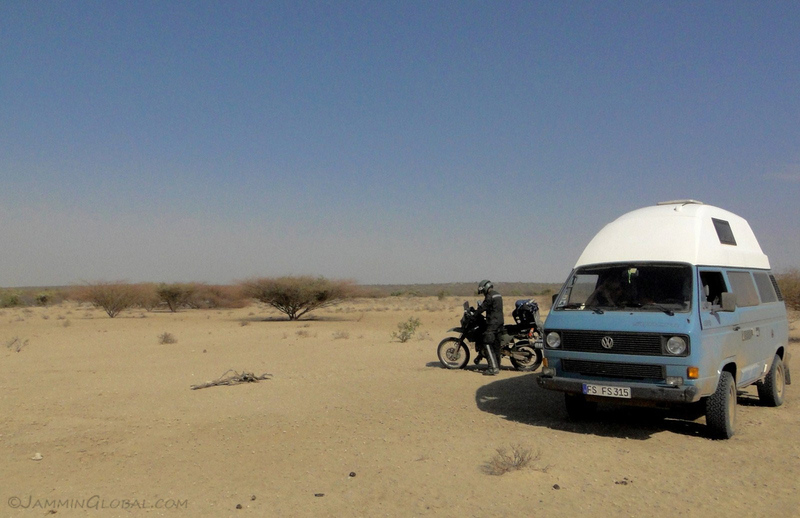 The Syncro and a tall acacia tree. 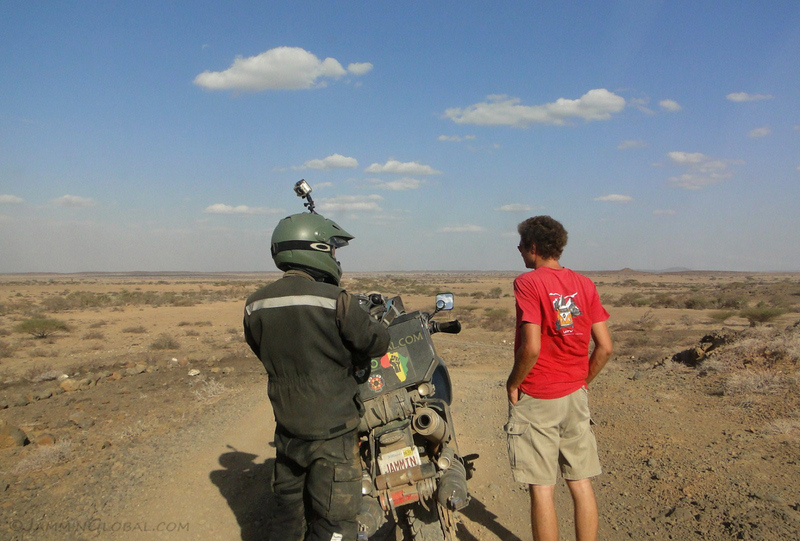 Ferdi and Katie were on a bit of a schedule as they had friends flying into Nairobi who were going to travel around with them for a bit, so we were pushing to make it to Loyangalani by nightfall. 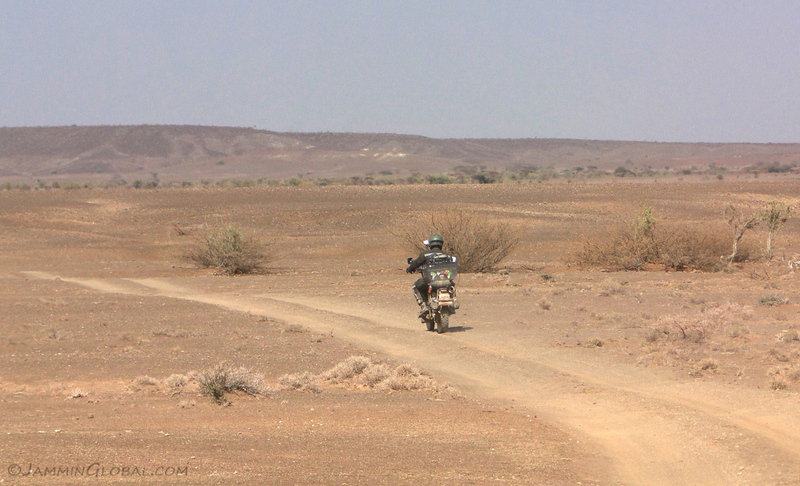 Riding through Africa. By now, my confidence level was high for riding on loose surfaces and I was very comfortable riding sanDRina at a fast pace through this landscape. Coming up to a sharp left turn. Before this, I wasn’t comfortable with rear braking while standing on the pegs, but I had that under control now and had no pucker moments on this ride. It was nice to have Ferdi and Katie following as they took all these wonderful photos of me. In return, I offered to film them from the front – that’s why my GoPro helmet camera is pointing back at them. The landscape changed with the changing light and I soaked up every view. Riding corrugations as the route allowed a faster pace. Taking a break and discussing with Ferdi whether we could make it to Loyangalani tonight or not. 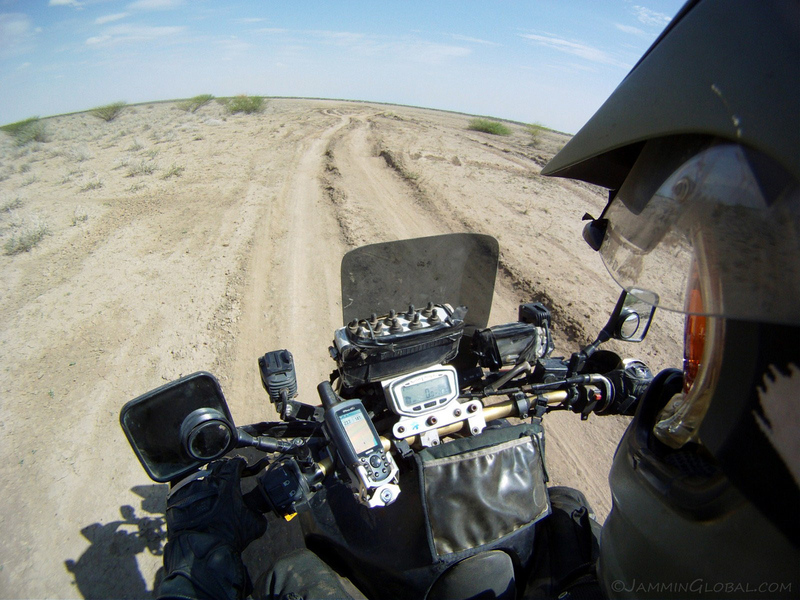 Check out the difference in gear between an overlanding motorcyclist and an overlanding motorhomer. 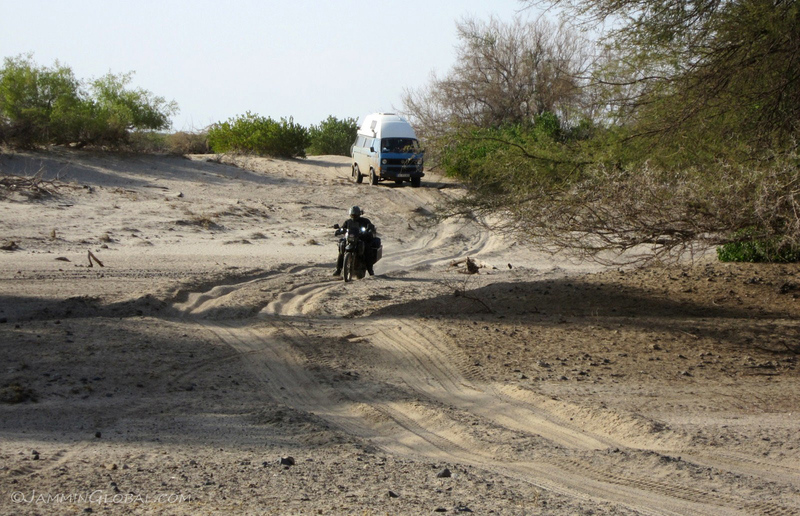 Ferdi and Katie commented on how tough riding a motorcycle through this terrain must be compared to sitting in a van. 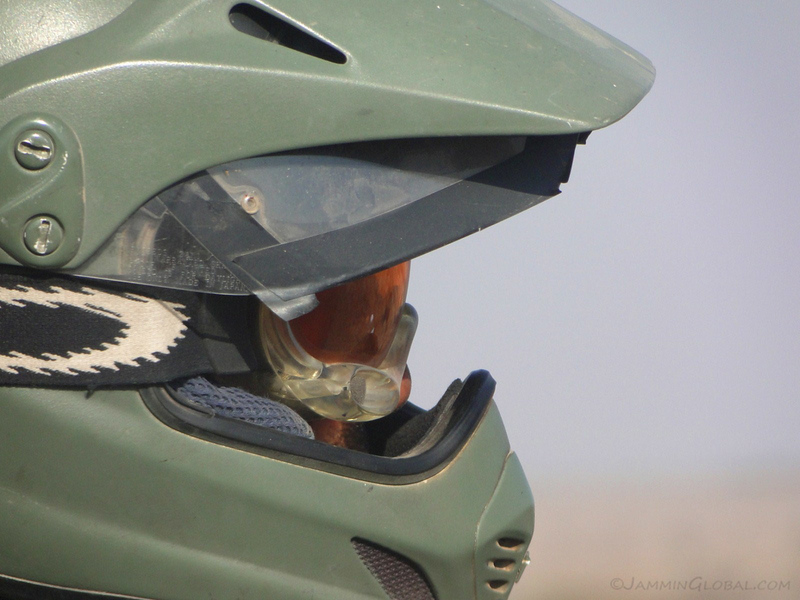 Katie capturing a close-up of my Arai XD helmet and Oakley goggles. A wonderful ride as the afternoon grew long. I was fatiguing but managed to keep my riding attention in check. 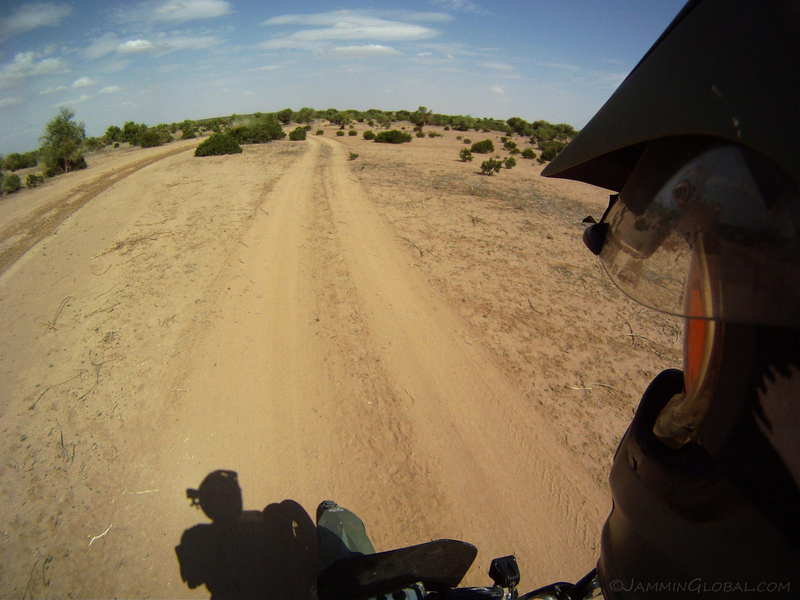 The landscape was covered in loose rocks and where the trail was heavily rutted or corrugated, we just rode beside the trail. 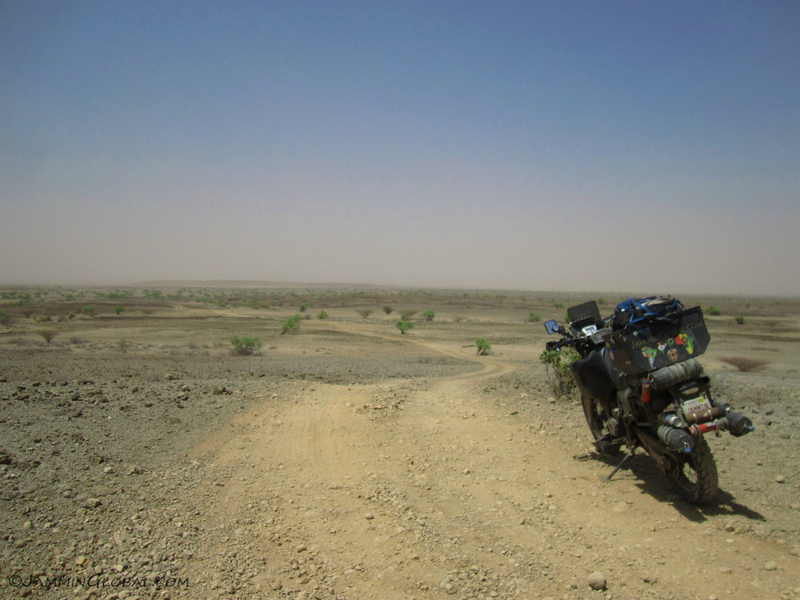 Where there were no rocks, it was fine sand, but a hard surface meant that we could keep the pace up. We rode up to sunset and then finally gave up on making it to Loyangalani. 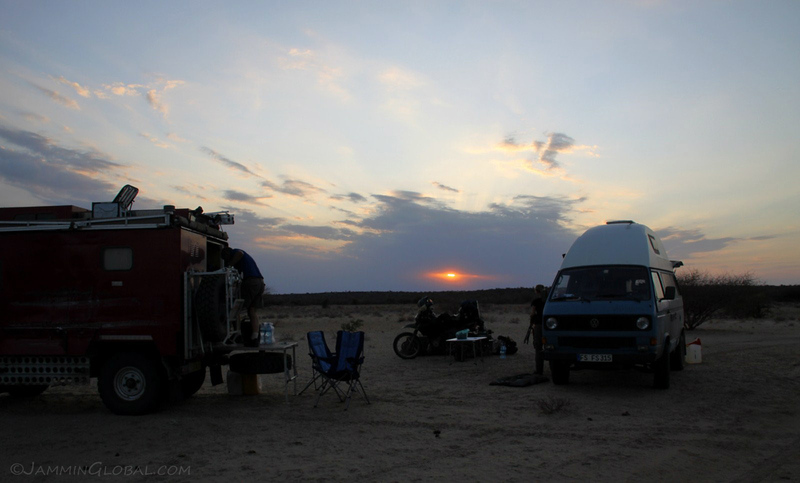 We bush-camped about 40 kms (25 mi) north of Loyangalani. 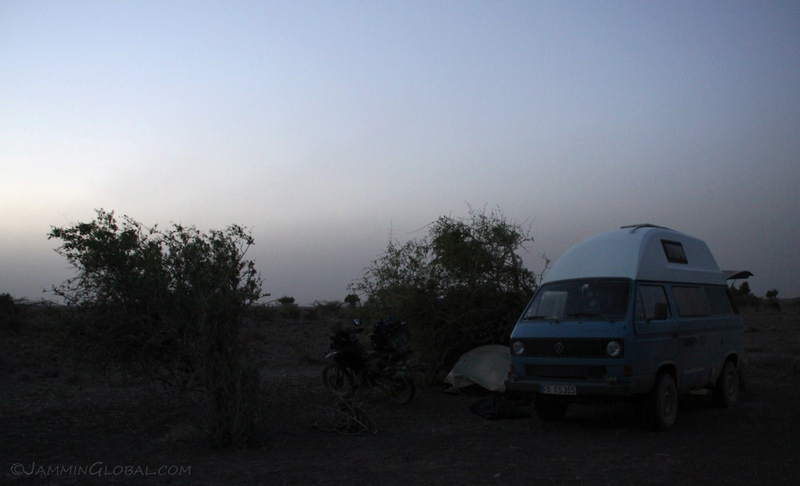 The winds were very strong and I setup my tent behind the Syncro. I enjoyed the luxurious feeling of a bush shower from a few liters of precious water and then had a relaxing evening with a home-cooked meal amid good company. Waking up for sunrise on the savannah. 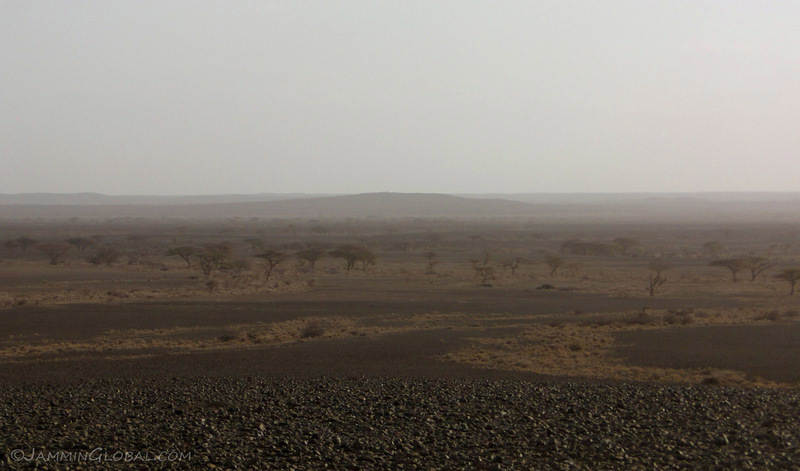 We were almost through the desert as the landscape slowly morphed into savannah. 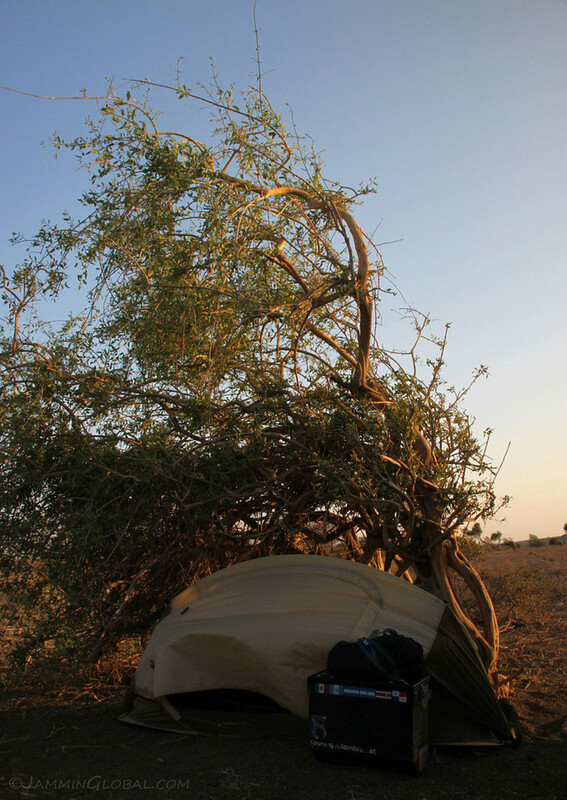 I parked my tent under this wind-blown acacia and used my pannier and rocks to make sure it wouldn’t get picked up by the strong winds. After another slow morning, we got back on the road heading to Loyangalani. But within a few kilometers, Ferdi flashed me with his lights and said he was hearing a loud screeching sound. I followed him a bit and traced it to his right front wheel. Putting the Syncro up on the high lift revealed the culprit – a stone lodged between the brake rotor and a protective plate. All was good and we were off soon. 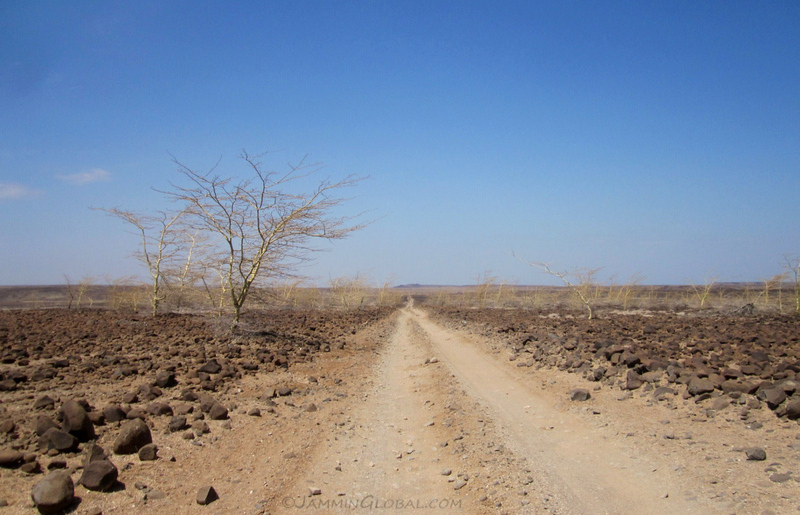 Riding through a volcanic boulder field, studded with yellow leafless acacias. At times, the trail disappeared into the boulder field and there was some serious rock climbing going on, where sanDRina’s big front wheel came in handy for easily scaling over basketball-sized boulders. 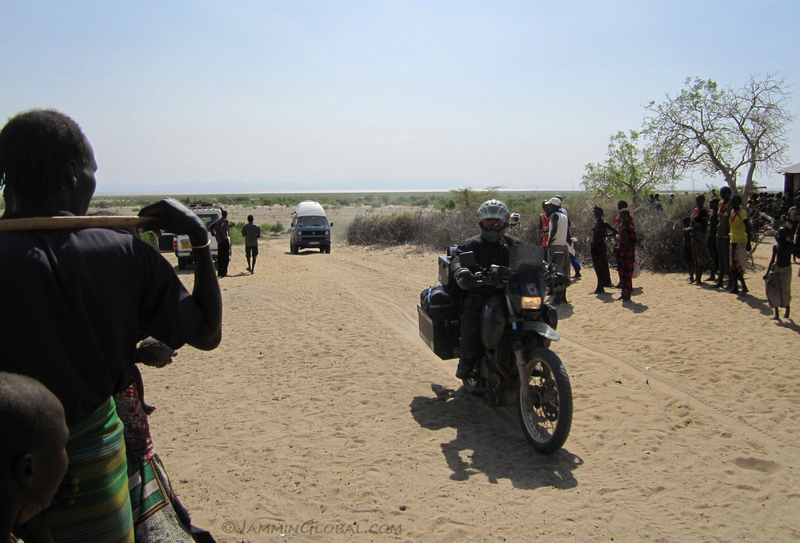 Finally getting up close to Lake Turkana, after riding alongside it for the past 250 kms (155 mi). 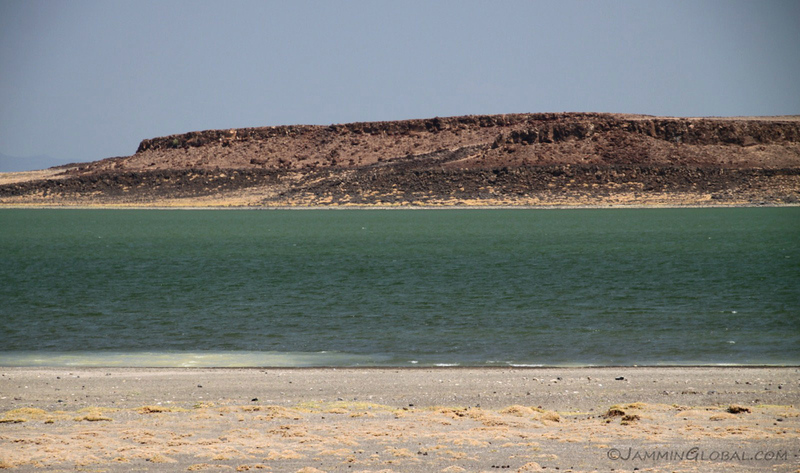 It is the world’s largest permanent desert lake and a prominent feature in the East African Rift. Its alternative name is the Jade Sea, due to the greenness from algae at the surface. The lake is endoheric (meaning it doesn’t have an outlet) and thus is slightly salty. Evaporation in the only means of exit for the water but that’s not a problem in the hot and dry environment. 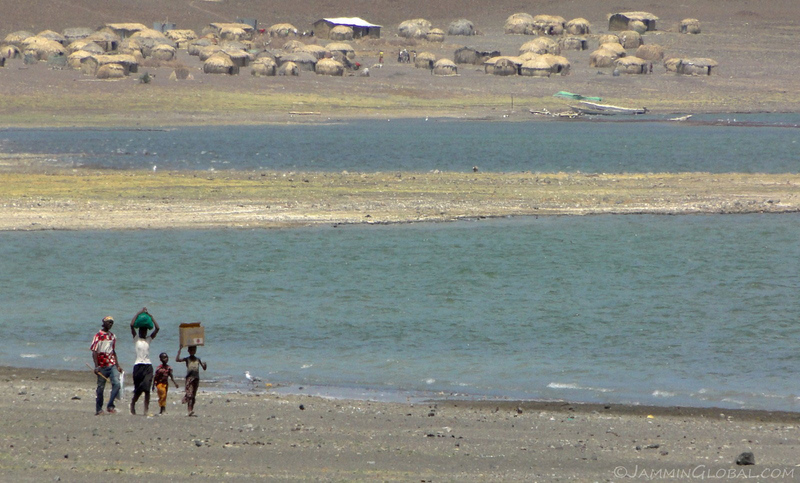 The Turkana people living on the shores of their giant lake that provides them with fish and potable but not palatable water. It is a rough existence but they seem to have found some balance with nature. But that balance can easily be tipped when the climate gets hard on them. 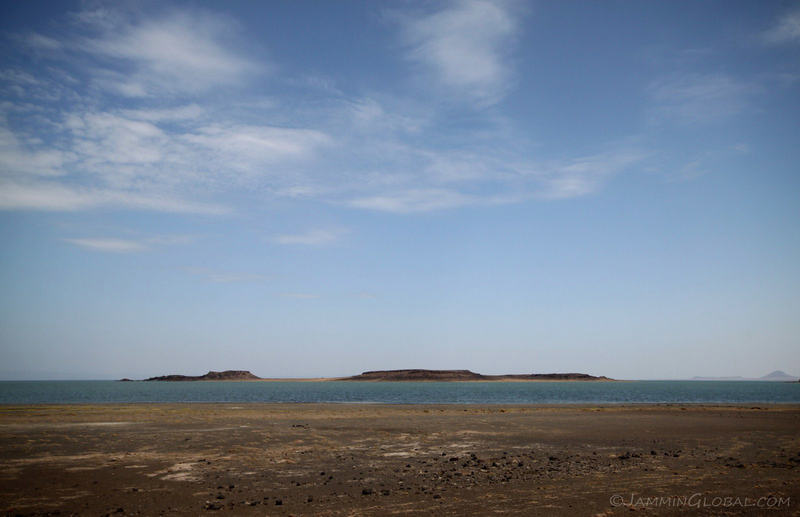 The area around Lake Turkana has seen hominins pass through over the past few million years and the dry environment has yielded many hominid fossils, such as Turkana Boy that reveal a bit more of the story of human evolution. 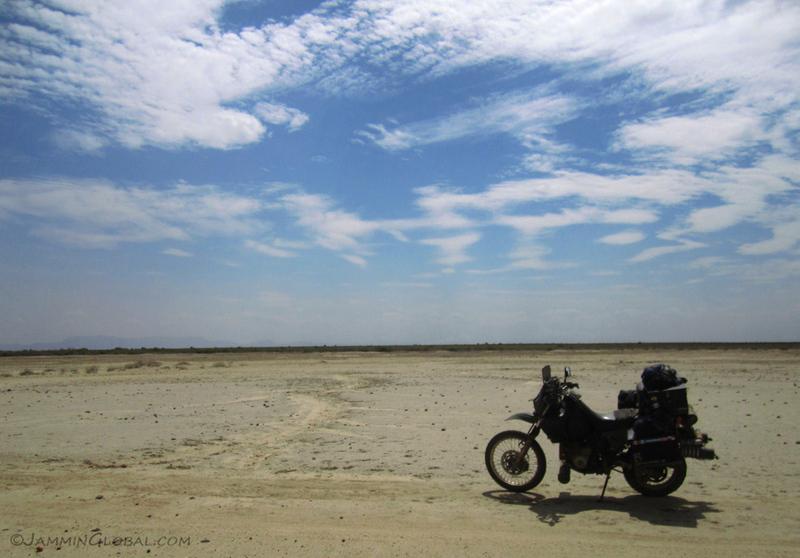 The Lake Turkana route was just as epic as I had imagined it. The sand was deep, the rocks were sharp and the riding was tough, but my offroad riding skills improved once more and I was feeling in my element after the first day. 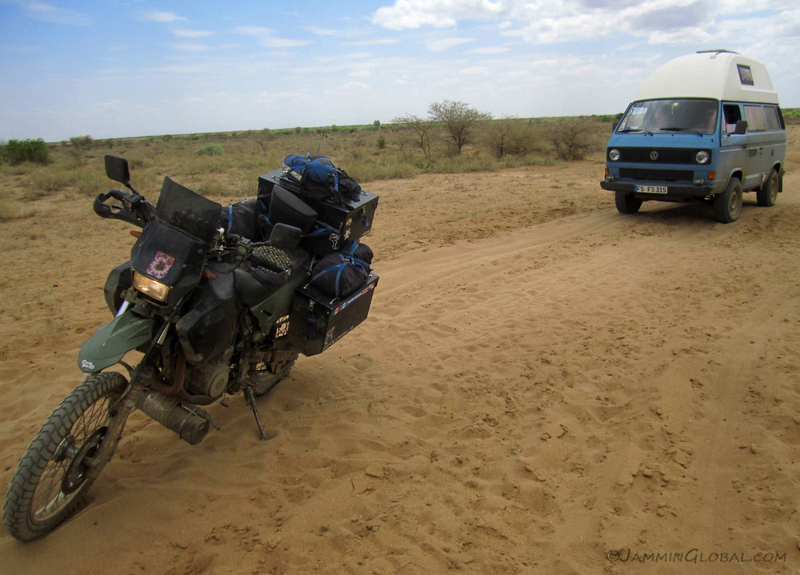 It helped that I could offload my panniers to my fellow travelers as that made sanDRina much more responsive in the changing conditions.